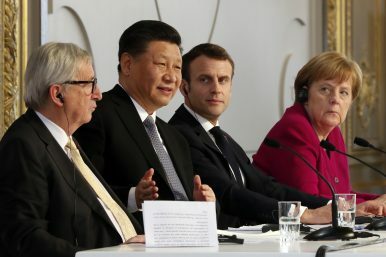 French President Emmanuel Macron, 2nd right, Chinese President Xi Jinping, 2nd left, German Chancellor Angela Merkel, right, and European Commission President Jean-Claude Juncker, left, hold a press conference at the Elysee presidential palace in Paris, March 26, 2019. And there’s the rub: Italy, which received just $500 million in Chinese investment in 2017, clearly hopes that signing on to the BRI will help it be more competitive in attracting Europe-bound investment. But the dirty secret of China deals is that, for all the political influence the Chinese government has over economic decisions, Chinese companies are still ultimately seeking a profit. A BRI agreement is not a panacea that suddenly makes a country’s investment climate irresistible for Chinese firms – and no piece of paper will change the fact that France is selling jet planes to China while Italy is offering oranges.